Teenaged twins Castor and Pollux Stone cajole their father into buying a space ship, and the entire family goes on a trip around the galaxy. But Castor and Pollux repeatedly end up in trouble with their schemes to make a fortune on distant planets. This is a hard book for me to review, so I’ll keep it short. 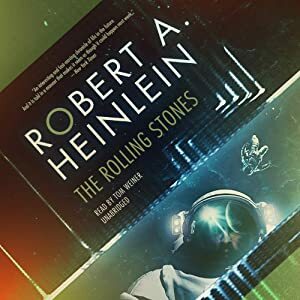 I’ve only read one other book by Heinlein, A Stranger in a Strange Land, and that was as a teenager, so I expected something a bit more serious and meaningful in this book. Is this what pulp is? I’ve only read one pulp-fiction book, A Princess of Mars, by Edgar Rice Burroughs, so I’m very inexperienced with the genre. It took me a while to get over the cheese. But I recognize that when you’re reading a book that was written in a style foreign to you, it’s better to view the book within its context rather than comparing it to your usual type. And after I approached the book from this perspective, I began to really enjoy the humor and even became emotionally invested in the characters. I wouldn’t say I highly recommend this book, but I enjoyed my second pulp experience.